Is Grantland right? Is AJ Preller a Buffoon? In short, no. The much reported on Grantland article by Rany Jazayerli tore AJ Preller a new one using many valid arguments and many stupid ones. Rany pointed out what we all know already, that pretty much every trade that AJ pulled off was a loser for this team. He pointed out the just terrible future payroll obligations for the Padres going into 2016 and 2017, and he pointed out the extremely limited payroll flexibility the team to fix things has as a result. But Rany also used the hack strategy of posing a “What if the Padres still had Jace Peterson and Cameron Maybin and everyone else” question and then stating the team would be better off. In hindsight, this is probably a true statement, but it totally ignores the context in which the moves were made. And the root of the moves was not a unilateral AJ Preller master plan, it was a strategy likely put in place by management and ownership before AJ was hired. Mike Costa of 1360 made an interesting statement yesterday on the Loose Cannons. His posited that the entire offseason, all of the AJ Preller driven craziness, was a butterfly effect started with #BSplaza. Mike Dee so screwed up with #BSplaza that the team had to do something BIG to bring the fans back. With the team 41-49 at the All Star break, it appears that Bud Selig is still taking a steamy dump on the city of San Diego. I’d stated something similar on the Gwynntelligence Podcast; that this past offseason was critical to win back the fans of San Diego, that the team was on the precipice of falling into a generational void unless it did something big. Well they did, which we all enjoyed and were excited about. Of course, Rany didn’t bring up any of this background information, which is critical to understanding why AJ did what he did. Rany also failed to discuss that AJ was likely given the job because of his willingness to play along with management’s desire to institute a quick turnaround. In reporting after the hire, it was noted that the team rejected other GM candidates because their plans for the team would take too long. Even as recently as a week ago, Ron Fowler showed his impatience in turning around the team when he said on 1090, “I can’t understand why it would take longer than a year” to rebuild the team. In the end, the entire chain of bad moves that Rany detailed in his article all had their root at ownership’s impatience, and in all likelihood, desperation to create a new level of excitement around this time at a critical juncture. AJ merely executed their plan to the best of his ability. When you really get down to it, AJ executed that plan as well as anyone could be expected to do. Just because the plan handed down by management is a bad one, it doesn’t mean that the execution of said bad plan was poor. Given payroll constraints (even with the increases this offseason, payroll only went up $18M), available players, and pieces we had to move, I can’t see a better execution of management’s plan than what AJ did. Here’s an example. One of the best Simpsons episodes involved Homer finding out his long lost brother Herb was the head of a major auto manufacturer. 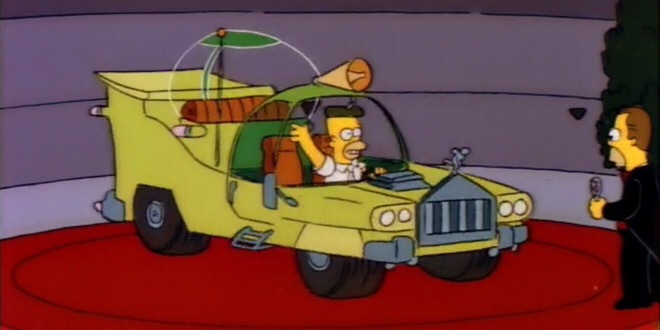 Herb gives Homer carte blanche to design his own car, a car for the everyman, the Homer. The car ended up being an abortion of a car with a sky high price tag. But do you blame the engineers that faithfully designed and executed the features that Homer stated were needed in his plan? The engineers executed and designed the car to the best of their abilities, but it wasn’t their failure. It was management’s for giving them a terrible plan to follow. I mean look at those bubble domes! What engineering! If anything, AJ’s execution gives me confidence that he can creatively and successfully execute a plan, now we just need for him to come up with a better plan than Uncle Ron and noted blunderer Mike Dee came up with. If AJ had a glaring failure, it was not knowing when to stop. If the goal was so low that he just needed to show that the team was “trying” and to create excitement, I believe he successfully accomplished this with the Matt Kemp trade. It was this move that got the average person in San Diego talking about the team in the office the next day. As bad as that trade has turned out, I think it’s defensible if it’s the only big move of the offseason. It’s a lot easier to create a rationale for that one consisting of off the field reasons including fan excitement and outreach to casual fans. At the point that AJ started trading off the rest of the future to get the team into the projected low 80 win territory, that’s when the alarm bells should have been going off. But they didn’t, and here we are, in the national spotlight where we wanted to be, but for the wrong reasons. While Rany’s attack on AJ Preller had some valid points, it went a little far to prove the thesis. Fan excitement is a difficult thing to measure and quantify. But there are measures that are quantifiable that were affected by the offseason. Attendance is up an average of 5k tickets per home game. This is a material gain for the team, that ideally, will be turned into additional payroll. Using a back of the envelope estimate of about $40 profit from each ticket, including ticket price and concessions, those additional 400k tickets equals an additional $16M of profit for the team. That’s a little less than 3 WAR of value. Whether the Padres can maintain those gains with or without the stimulus of the 2016 All Star Game remains to be seen, but there is a hard, material value to the moves made. Look, the team’s not in a good spot. Despite my attempts at optimism for 2016, I can’t come up with a feasible scenario for AJ to build a playoff roster, short of Fowler adding another $30M to payroll. The payroll constraints are too tight, the performances of long term pieces like Kemp and Bossman Junior are so bad, and the bullets in the minor league gun to make more trades are so limited, that I don’t see a path. But if there’s one thing AJ showed last offseason, it’s that given a plan, he will execute it fantastically. Let’s just hope he comes up with the plan this time. Although I do think there is correlation, I’m not fully convinced of causation (even though “butterfly effect” insinuates an indirect kind of causation). There has been plenty of other off-field blunders. #BSPlaza (although the biggest blunder – you guys even did a ranking of blunders at one point) was simply the straw the broke the camel’s back. We can’t really point to just #BSPlaza when we talk about the team’s off-field ineptitude. But yes, I think the team felt the need to do something big on-field to counteract their off-field idiocy. It’s just sad that the tiniest bit of common sense, humility, and honesty would have gone a long way with this off-field crap. Mike Dee has none of those qualities. The solution to off-field idiocy shouldn’t be on-field moves (common sense). The solution should be admitting mistakes and learning from them (humility and honesty). Oh, anyways, Preller isn’t a buffoon. Hindsight is always 20/20. But Preller was definitely coerced into making trades that focused in part on name recognition instead of fully focused on baseball playing ability. The buffoon is Mike Dee, but we of course knew that before the offseason really got started.